For Halloween this year, my construction-obsessed 3-year-old wanted to be a backhoe driver. Dressing him up as a construction worker was going to be easy – a hard hat, construction-style boots, jeans, a flannel shirt and a ‘safety’ vest with reflective tape – but how would people know that he was more than just a construction worker, that he was a backhoe driver? 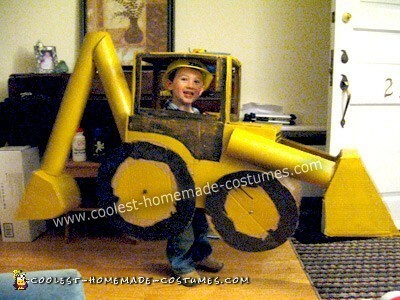 I couldn’t let that misconception happen, so I went to work with cardboard boxes, an exacto knife and a hot-glue gun to start this Homemade Backhoe and Driver Halloween Costume. Before making a single cut, I looked up images of backhoes online, to make sure I had the right idea. With the print-out of half a dozen backhoe images (different perspectives, photos as well as drawings) in-hand, I pieced together two boxes to form the main tractor, another box, split in half and shaped appropriately, for the two scoops, a heavy-duty cardboard tube that I pilfered from a dumpster, another cardboard box from which I cut the four wheels, and four mismatched nuts & bolts to secure them to the truck (had to make sure the wheels would turn, after all). We found returned paint ($1/can) in yellow and black from the local hardware store, painted the machine in sections before attaching the various parts, then put it together and added the final touches. Et voilà – la pièce de résistance: the backhoe! Very appropriate, being near to Christmas….